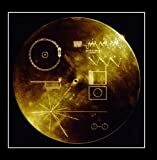 Elvis Presley, The Beatles, Michael Jackson, and hmm, Kenny Rogers may have a lot of gold records on their walls, but the famous Golden Records traveling aboard NASA's Voyager 1 and 2 space probes are the ultimate ones. 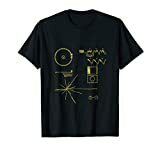 These gold-plated audio-visual discs contain photos, sounds of the Earth, music samples, greetings in 60 languages, scientific information, and how-to diagrams etched on the front to access it all. 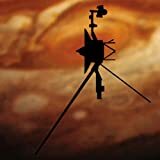 They were meant to hopefully one day be found by a friendly intelligent alien species who won't use the info to find us and invade us for resources or retrofit one of the Voyager probes into an all-powerful entity with a twelfth-power energy field known as V'ger. 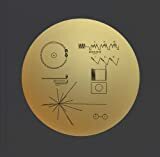 The good news is that you can now hang a replica of one of these disks on your wall next to your PhDs in rocket science and astrophysics like some kind of geek rockstar with this cool new Voyager Golden Record Sleeve Wall Art. 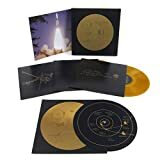 This fun plaque has a reproduction of the golden record made from engraved, polished brass, a museum-style label below it, and an information booklet explaining it all. Size: 13" W x 16" T x 1" D x 12 1/8" Diameter - 2 lbs.